Anne will show 37 quilts that tell stories – from memorial quilts in honor of her parents to quilts about newly discovered ancestors who “demanded” to be in a quilt. See these one-of-a-kind quilts and hear their stories. There is a quilt about a teenaged Civil War soldier, a great aunt who became a doctor in 1906, a little girl who was run over by a covered wagon on the Oregon Trail (and survived), and many others. Anne’s quilts use traditional patterns and new techniques, including photo transfer, words, and embellishments. This combination of a PowerPoint presentation and trunk show uses many of the quilts from the previous lecture, with added information on the discovery of Anne’s ancestors. The quilts are about people who lived during the times of the Mayflower, Revolutionary War, Civil War, Oregon Trail, Mormon Trail, Prohibition, Great Depression, and WWII, plus special ladies from the 1800’s. Their true stories are inspiring, surprising, and occasionally shocking. This trunk show has a variety of mostly bed-sized quilts (different ones from the family history lectures) collected and created over 30 years. Included are antique quilts, a Baby Jane, appliqued irises, a quilt within a quilt, Hawaiian Dresden Plate, Delectable Mountains, friendship quilts, the Bus Stop Quilt, and a quilt with coffee cups and coffee quotes. Lots of quilts and lots of stories. This lecture is a combination of a PowerPoint presentation and trunk show. 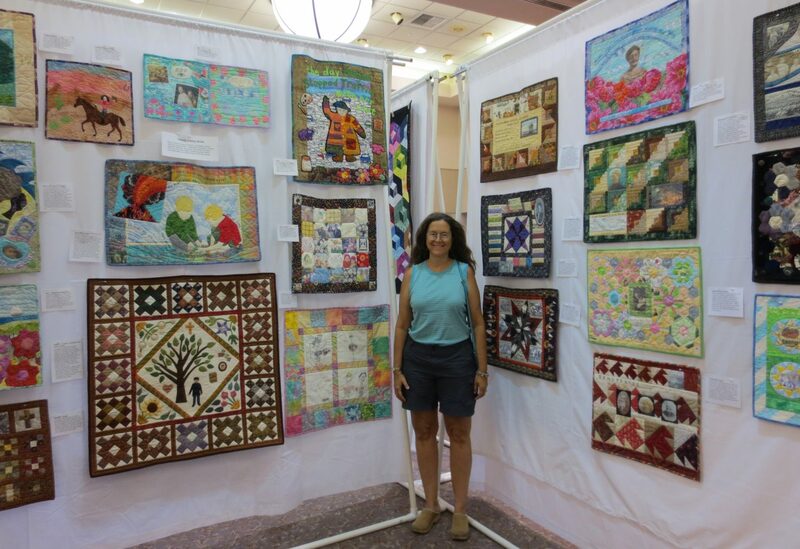 You will see many fabulous quilts depicting animals, including Eagle (Scout) quilts, a gigantic multi-color elephant, Alice’s Cheshire Cat, and the Quilt of Many Cows. The lecture also explores traditional blocks about animals: farm animals, wild animals, birds, pets, etc. Why did long-ago quilters make blocks about some animals, but not others?